Egyptian couple Ali Farag and Nour El Tayeb wrote their names into the history books earlier today (October 14) as they triumphed at the 2017 U.S. Open Presented by Macquarie Investment Management to become the first married couple in sporting history ever to win the same major sports title on the same day. 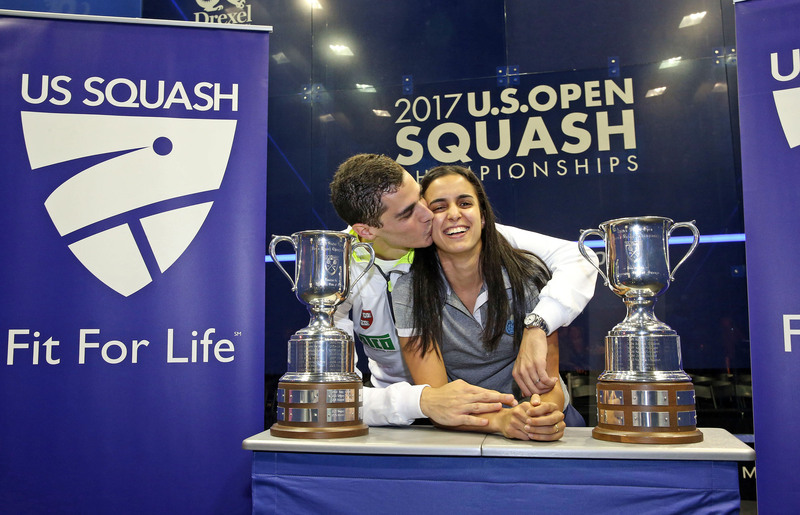 Competing inside Philadelphia's Drexel University the duo - who married last summer - defied the odds to defeat higher seeded and higher ranking opposition to secure the titles, the first PSA World Series titles of both of their careers. 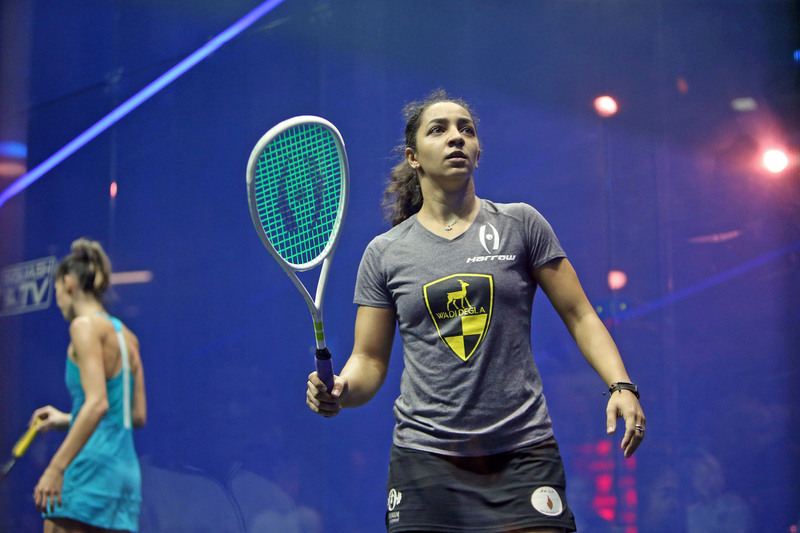 After felling World No.1 Nour El Sherbini and World No.4 Laura Massaro to reach the title decider - her first appearance in a major final since losing the 2015 edition of the U.S. Open - El Tayeb continued to play some of the best squash of her career to defeat compatriot and World No.3 Raneem El Welily in a breathtaking five-game affair that saw her twice come from a game behind to take the spoils. Meanwhile Farag produced a masterclass performance to dethrone 2016 title winner Mohamed ElShorbagy, the World No.3 who reigned supreme atop the World Rankings from over two years, in straight-games, securing his first major title and firmly establishing his credentials as one of the elite players on the men's circuit. “I always believed in myself and this win is going to make me believe even more and hopefully I carry this momentum into future tournaments. I can enjoy it tonight and then tomorrow I have to forget about it and move on. 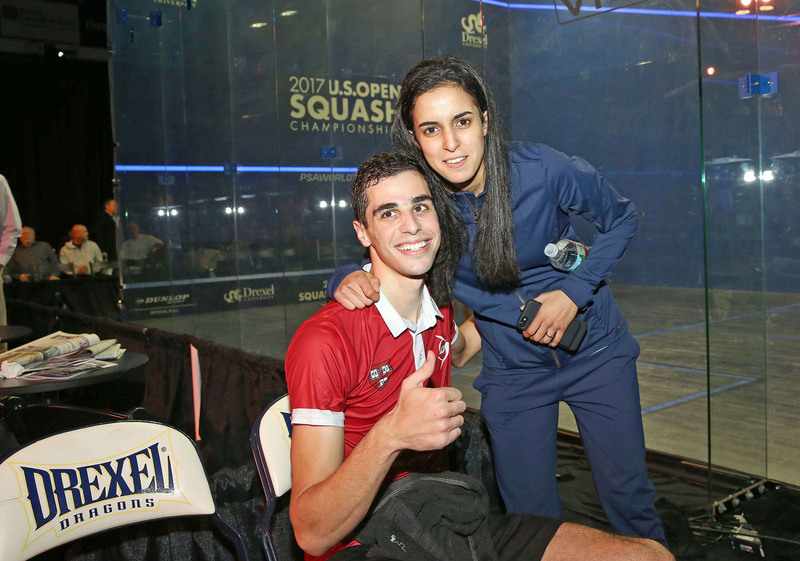 Egyptians Ali Farag and Nour El Tayeb, the Cairo-based pair who married in 2016, will be hoping for double-delight during the finals of the 2017 U.S. Open Presented by Macquarie Investment Management after they became the first married pair ever to reach the finals of the PSA World Series event as part of an Egyptian quartet who completed a clean sweep on semi-finals day. Just over one year since their wedding day the pair enthralled the crowd inside Philadelphia's Drexel University as they produced similarly scintillating performances to defeat their last four opposition in the shape of England's Laura Massaro and fellow Egyptian Omar Mosaad - with Farag's 3-0 win securing him a place in a World Series final for the first time in his career. 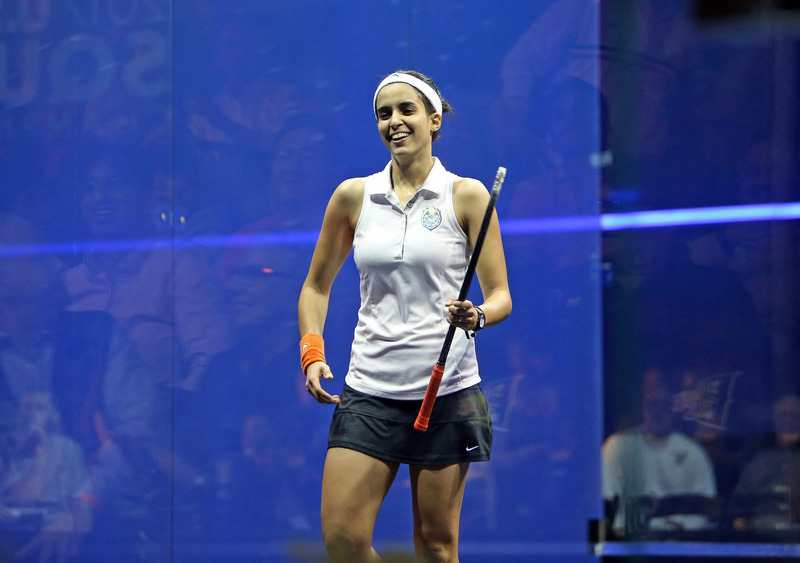 In a repeat of the 2015 U.S. Open final - which she lost 3-2 - El Tayeb put in a performance of pure class as she dismantled Massaro with a shot-mains masterclass to come through 3-1 and book her place in the finale. “I’m very pleased with my performance,” said 24-year-old El Tayeb. “Laura and I played a few years ago in the final here and I was so nervous that time - so today I was telling myself that it’s just a regular match and to go out there and enjoy it, which I did. “She doesn’t give up and she keeps going - she takes advantage of any loss of concentration from any of her opponents. That’s something I learned from her and it’s unbelievable to beat her in such an occasion. World No.14 El Tayeb will go up against 2012 U.S. Open runner-up Raneem El Welily, the current World No.3, for the honours after she halted the charge of New Zealand's Joelle King. “It feels absolutely fantastic to reach the final," said El Welily. "Joelle is in fantastic form, I played with her here last year and it was something similar to today's match. “She has had a great season and has beaten everyone in the top five. I just tried to keep pushing and digging as much as I could – she was playing really well. I think I broke her mentally and that was key. 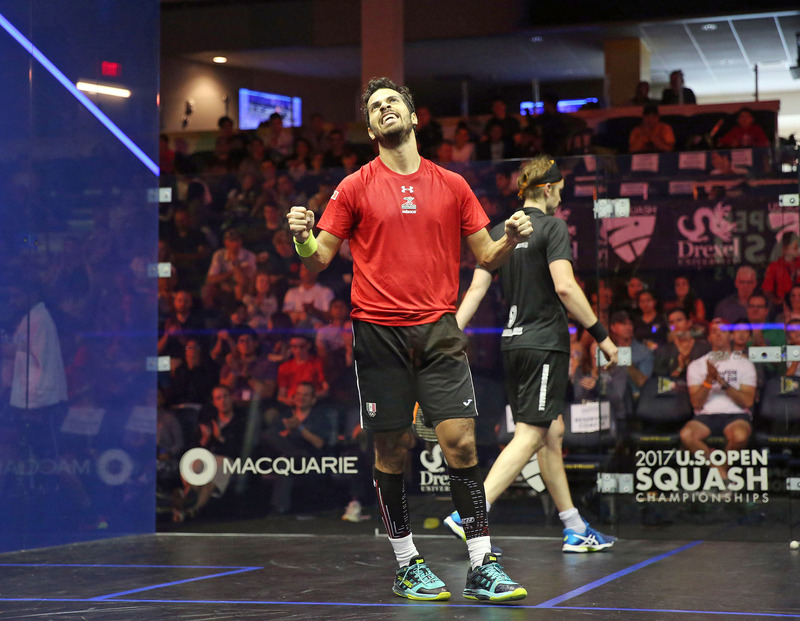 Farag, the 25-year-old Harvard graduate, secured his place in the title decider courtesy of a dominant straight-games victory over Mosaad - the 2015 runner-up who returned to top form this week after suffering a dip in form through the past two years. Farag weathered a Mosaad onslaught during a crucial 14-12 second game to set up the platform that ensured his progress to face defending title holder Mohamed ElShorbagy. “I feel very happy to get past such a tough opponent,” said Farag. “Omar is never easy to play against, he’s finding his form again and so to get a win against him is a great pleasure, but there is still the final tomorrow so I will just enjoy this for half an hour and then start focusing on tomorrow’s match. “I knew today was going to be tough so I’m really pleased to be through - it's special to be into the final along with Nour, but it will be even more special if we can hold the trophies together." 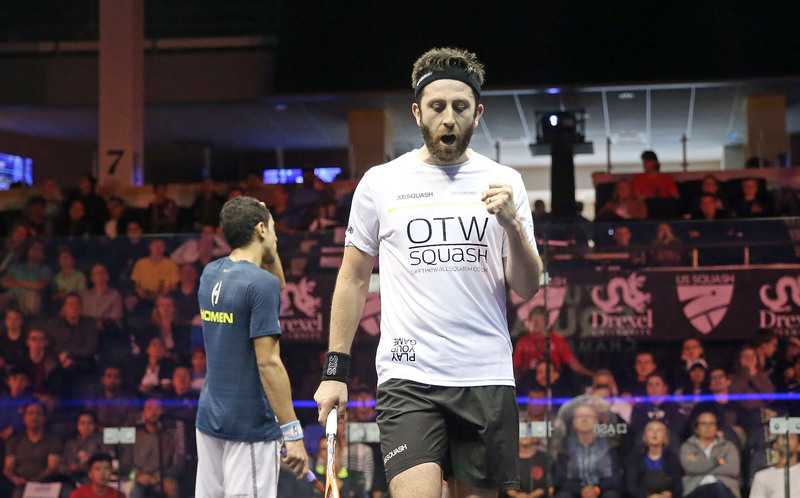 After his victory over England's Nick Matthew, in a repeat of the 2016 final, ElShorbagy said: “Every single point was very important today. “The level of squash we have played so far, I think we are playing even better than last year but sometimes it’s the luck of the draw and we both had to deal with it as professionals. New Zealand's Joelle King will compete in the semi-finals of a PSA World Series tournament for the first time in over three years after she downed England's Alison Waters 3-1 to secure a last four berth at the 2017 U.S. Open presented by Presented by Macquarie Investment Management. The 29-year-old, who missed over a year of competitive action after suffering from an achilles injury in 2015, last made it to a semi-final at the 2014 Windy City Open but continued to display a re-discovered confidence on court as she followed up her second round win over 2016 champion Camille Serme with a polished performance against Waters. The win, which came after 43-minutes of action, sees her through to meet Egyptian Raneem El Welily - the player who beat her in that semi-final in Chicago - for a place in the tournament decider. “Camille is a good player and she won this tournament last year so I know that if you beat her then you are playing well,” said King. “But you kind of have to leave that behind and focus on the next match and Alison was always going to be tough. We were both ranked four and five in the world for a while so had a lot of battles in the past. El Welily meanwhile came through in four games over compatriot Nouran Gohar, bouncing back from dropping the first game to prevail 11-13, 11-7, 12-10, 11-5 and keep alive her hopes of winning a first World Series title since the 2017 Windy City Open in March. “We’re teammates and we also play for the same club, so we know each other’s game quite well," said El Welily after the match. "But everyone goes on court with a different attitude and a different personality. 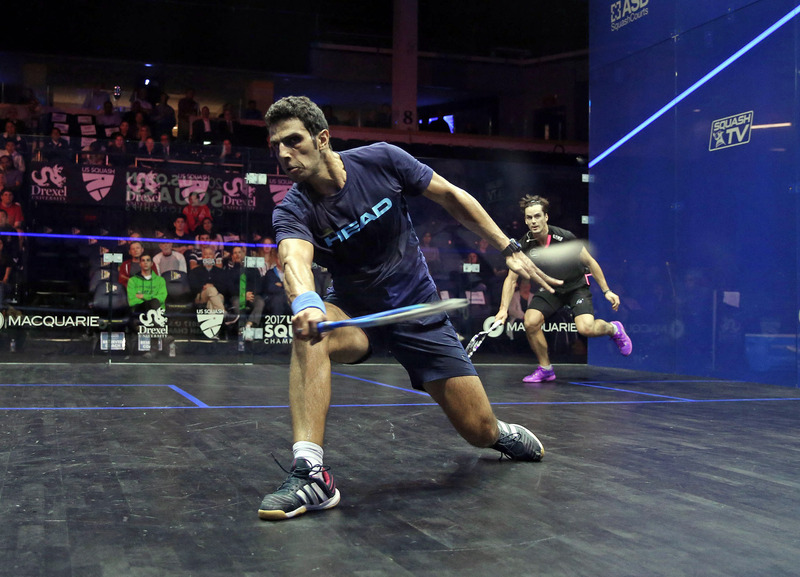 In the Men's draw Omar Mosaad, who impressed in his straight-games second round win over the in-form Paul Coll, continued a recent resurgence to defeat Peruvian Diego Elias and set up an all-Egyptian last four clash with Ali Farag, the current World No.5. Former World No.3 Mosaad finished runner-up at the 2015 U.S. Open during what was his breakthrough event before embarking on a run of poor form that saw him fall to a current 10-year ranking low at No.31, but he produced a performance worthy of his former ranking to halt the charge of the rising 20-year-old talent. “I really enjoy playing here,” said Mosaad. “I love to be in Philly and I love the atmosphere here. I’m enjoying the crowd and I’m really pleased to be through to the semi-final here for the third time. 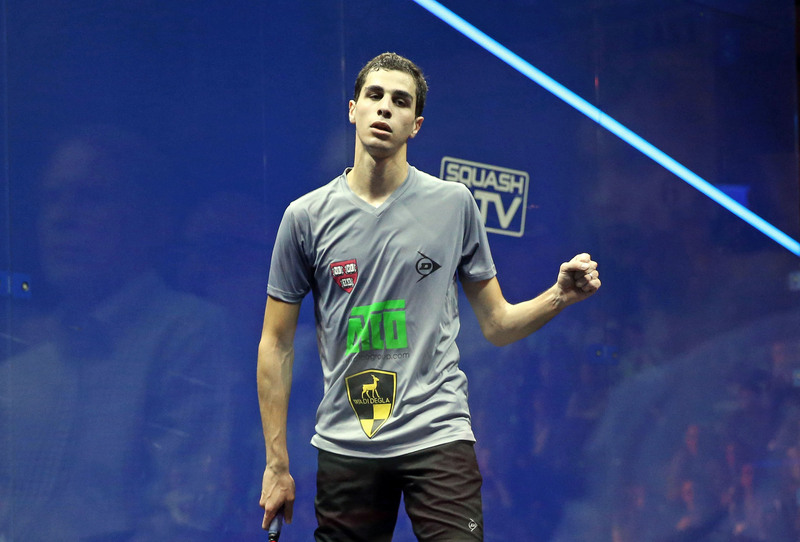 Farag meanwhile will compete in the semi-finals of a World Series event for just the second time in his career after coming through a brutal five-game 87-minute encounter with Fares Dessouky. "It was pure guts that got me the win today," said Farag. "Squash wise he was the better player but I'm just so happy to be through. “The first three games the ball was flying and I thought he adapted to it better than I did because I just couldn’t find any rhythm. "I hope I can keep it going tomorrow. It's another battle with a good friend. Omar and I play at least twice a week and it's so good to see him back. He's been working hard and deserves to be where he is." Af ter 2016 champion Camille Serme and eight-time World Champion Nicol David crashed out of the 2017 U.S. Open Presented by Macquarie Investment Management at the second round stage, the shocks continued to flow inside Philadelphia's Drexel University as World No.1 Nour El Sherbini saw her title hopes dashed by compatriot Nour El Tayeb at the quarter-final stage. 24-year-old El Tayeb reached the final of the PSA World Series tournament in 2015 only for injury to strike and rule her out for over six months but she proved that she is back to her very best form as she put in an astute and polished performance that saw her out-manoeuvre El Sherbini and come through 13-11, 5-11, 11-5, 11-7. "Nour has been the in-form player over the past 18 months so this is definitely one of the best wins of my career so far," said El Tayeb. "I'm very happy to be through to the semi-finals. I reached the final here two years ago but got injured and I'll never forget that event. It took a year to come back from that injury and another year to recover that physical and mental strength to compete. "So to win today gives me a lot of confidence and belief that I can play at this level and hopefully I can keep it up for two more matches." 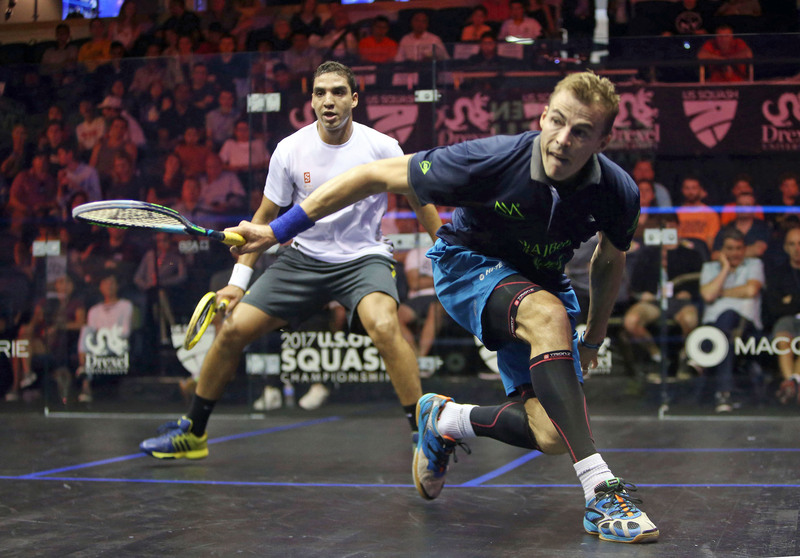 El Tayeb will go up against England's Laura Massaro for a place in the final after the 2016 tournament champion came through in four games against Hong Kong's Annie Au while Massaro's compatriot Nick Matthew, the 2007 U.S. Open champion, prevailed in an all-English battle with Daryl Selby. 37-year-old Matthew, appearing in his last ever U.S. Open, showed the kind of mental grit and resilience that has epitomised his career as he grinded his way through a bruising 26-minute 15-13 opening game to sap energy from Selby and break the World No.16's spirit - setting up the platform for a 3-0 win that takes him into the semi-finals without dropping a game. “Tonight that first game was crucial,” said Matthew. “I knew that it was a hard first game and that the work was in his legs so I tried to push on in the second. Psychologically I’m happy with how I finished it off in three, especially after winning the first. "And I'm pleased to be back in the semi-finals again. I can probably count on one hand the number of times I've reached the semi-finals of an event without dropping a game so there's no excuses for me not to be fresh and ready for the semi-finals. "I'll be ready to take my opponent on physically and I look forward to the battle to come on Friday." Matthew will face Mohamed ElShorbagy, the man he lost to in last year's final, in the last four after the Egyptian downed Simon Rösner of Germany 3-0. Speaking after the match ElShorbagy said: “In the second game I was down 8-6 and I needed to give it a big push to try and be 2-0 up. “There is a huge difference between 1-1 and being 2-0 up, so I’m really happy to be able to get the win in three. New Zealand's World No.10 Joelle King showed impressive poise and composure to come through a nerve-racking 66 minute battle with World No.3 Camille Serme that saw her end the Frenchwoman's title defence during the second round of the 2017 U.S. Open Presented by Macquarie Investment Management. The 29-year-old scalped both Nicol David and Laura Massaro at her first event this season, September's China Open, and kept up her giant-killing form to come from 2-1 down and prevail in an intense encounter that saw her showcase the kind of physical strength and skill that enabled her to rise as high as World No.4 in 2014 before suffering a long term achilles injury. Playing with patience and poise it was King who took the opening game courtesy of a comfortable 11-5 scoreline, but Serme replied in style to take the next two games and leave King staring down the barrel of defeat. Undeterred she maintained her composure to come through a tense fourth game and then recovered from squandering four match balls in the fifth to seal the win 11-5, 4-11, 6-11, 11-9, 13-11. “Camille is a classy player and has won some of the biggest tournaments - including this one - so to come away with a win against her is huge for me," said King. “I was four in the world when I got injured and I guess a few people didn’t think I would be able to get back to that standard after such a major injury and I guess for a period there I didn’t think I was going to get back either. “So the main thing for me is that I’m trying to play at that level again and hopefully I can continue the form that I have started with this season and see where it takes me. She will now face England's Alison Waters in the quarter-finals while Raneem El Welily and Nouran Gohar set up an all-Egyptian battle following wins over Tesni Evans of Wales and Joshna Chinappa of India. While in the Men's draw Peru's Diego Elias kept up his impressive early season form to defeat World No.6 Marwan ElShorbagy. The 20-year-old from Lima was agonisingly close to defeating World Champion Karim Abdel Gawad during his last event - the NetSuite Open - and continued to demonstrate experience beyond his age as he utilised all four corners of the court to come through 11-5, 11-9, 11-9 in 46 minutes. “It’s was hard,” said Elias afterwards. "With Karim during NetSuite I was 2-0 up and I got a bit tired. I had a tough match the day before and I think it was more in my head. “This time when I was 2-0 up I had that in my mind and wanted to make sure it didn't happen again. I’m feeling good this season." 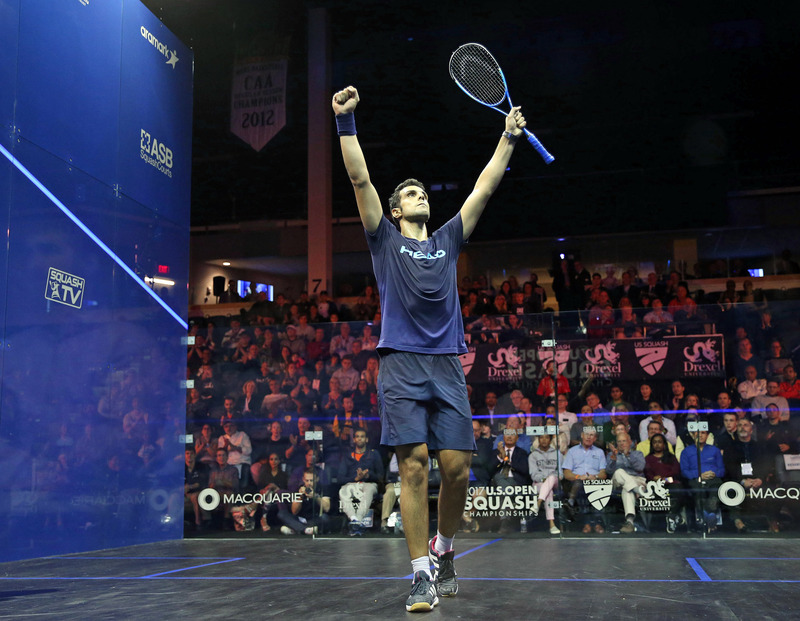 Elias will now face Omar Mosaad for a place in the last four after the former World No.3, back at the court where he reached his first ever World Series event final in 2015, downed the in-form Paul Coll while the other winners on day four inside Philadelphia's Drexel University were Egyptian pairing Ali Farag and Fares Dessouky. 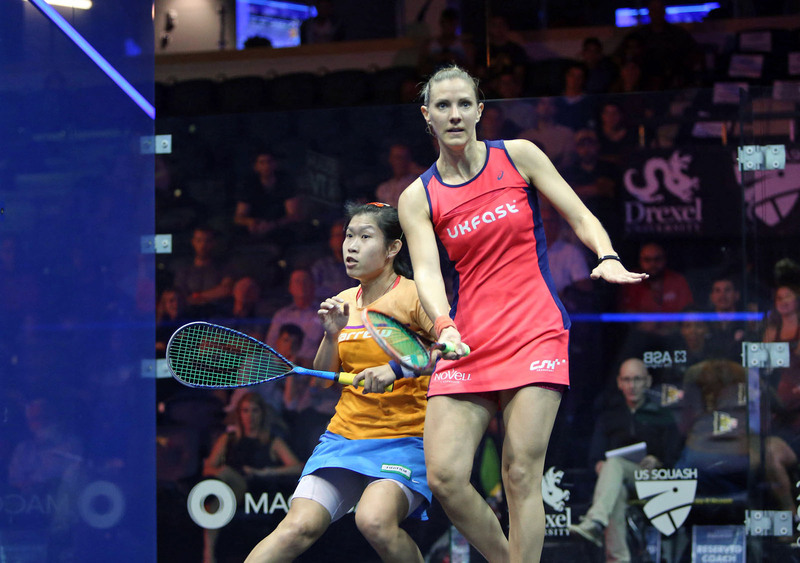 Hong Kong's Annie Au recorded the biggest win of her career to defeat eight-time World Champion Nicol David for the first time ever and secure an unexpected berth in the quarter-finals of the 2017 U.S. Open Presented by Macquarie Investment Management. In 17 PSA World Tour matches spanning almost a decade the Hong Kong player had only ever taken three games from David in total - the last of which came in 2012 - but under the lights inside Philadelphia's Drexel University the World No.9 put on a short-game masterclass against 33-year-old David to claim an unexpected place in the last eight where she will take on England's former World No.1 Laura Massaro. Utilising her patented lob-drop style Au managed to disturb David and take the Malaysian out of her comfort zone early on. While David, who looked far from her best on court, managed to mount a resurgence in the third and fourth to keep the match alive it was Au who looked the more relaxed and confident player in the decisive fifth as she maintained her composure to complete a 11-5, 11-5, 10-12, 8-11, 11-7 upset. "I feel really, really happy right now," said Au. "To beat Nicol - in my first ever win on the glass court at this event - is a massive result and makes all the hard work over the summer feel worth it. “At 2-0 love I started to think about the win and I began to rush and make some mistakes which gave her confidence. She can come back from any scoreline so I had to get back to my game plan and play patient squash in the fifth. "I had to come out in the fifth and imagine it was the start of the match again. I forgot about the score and just tried to play each point. "I had already booked my travel for tomorrow so I will have to change my flights! But I have a day off tomorrow to enjoy this win and prepare for the next match now." Au will face Massaro after the Englishwoman beat compatriot Emily Whitlock 3-0, with Egyptians Nour El Sherbini and Nour El Tayeb also due to meet after coming through their second round encounters with Victoria Lust and Salma Hana Ibrahim, respectively. 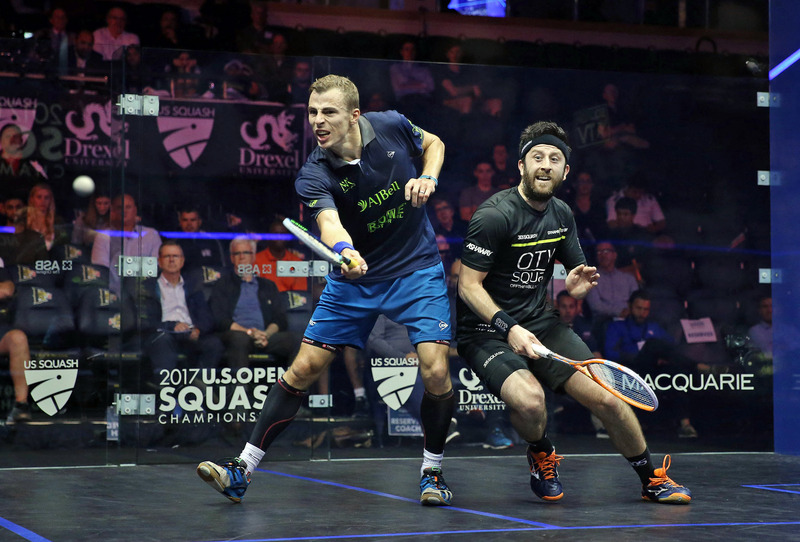 In the Men's draw there was double delight for English squash fans as Nick Matthew - the 37-year-old two-time U.S. Open winner - was joined by compatriot Daryl Selby, with the pair set to clash for a place in the semi-finals following Selby's mammoth 3-2 win over Tarek Momen. Selby was at times sublime as he twice recovered from squandering game leads to come through a topsy-turvy 102 minute battle and reach the last eight of a PSA World Series event for just the second time in two years. “I don't know what to say – it was an up and down match,” said Selby. “I felt like I was in control for long periods but then I was also under the cosh for periods as well – he's so fast and dangerous around the court. “I'm proud of how I dug in and showed some fight and determination especially in the fifth. I think I kept my focus a little longer than him throughout that game – but the difference was just a few mistakes in the end. 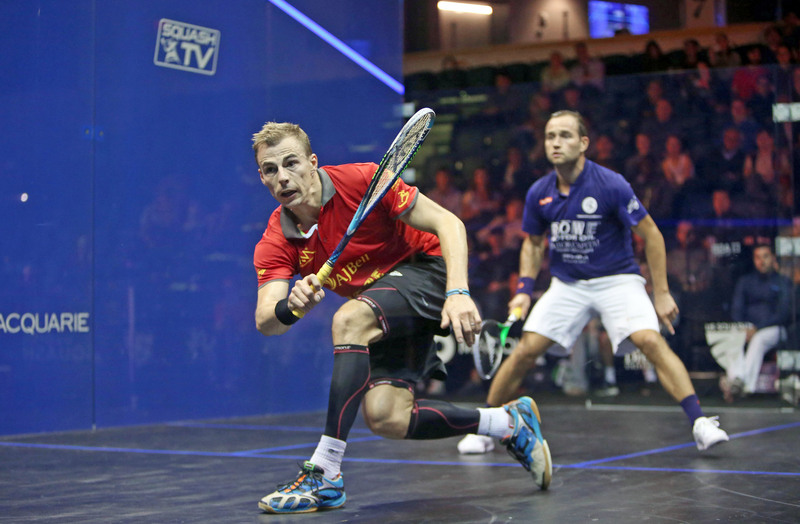 Matthew meanwhile was in total control as he dispatched Frenchman Gregoire Marche in straight games. “I will enjoy this win for ten minutes but then it’s back to focusing,” said Matthew following the game. “I’ve had a good win but I’ve got to do it against a high calibre player in the next round and then hopefully another high calibre player again as you get further into the tournament. Defending champion Mohamed ElShorbagy and German Simon Rösner were the other winners on day three of competition. New Zealand's World No.10 Paul Coll pulled off one of the biggest wins of his career as he knocked World Champion and tournament top seed Karim Abdel Gawad out of the 2017 U.S. Open Presented by Macquarie Investment Management in the first round. Coll, who has forged a reputation as one of the fittest and strongest athletes on the PSA World Tour, played to his strengths to extend the rallies early on and force Gawad into an attritional battle that goes against the Egyptian's typically flair-based game. And it was a tactic that paid dividends as he came through a close first game 11-8 before doubling his advantage courtesy of a comfortable 11-3 second game. 26-year-old Gawad though turned the tide in the third game, finding his range with greater accuracy and nullifying Coll courtesy of a series of sweetly struck winners. But the comeback was short-lived as Coll again assumed the ascendency in the fourth to grind out the win and seal a huge upset victory. "It's definitely one of the most significant wins of my career," said Coll. "I've known for a long time that I'd be playing him. I’ve been working really hard during the off-season and I’m cashing in on some of that now - to beat someone like him in round one is huge. "I stuck to my game plan and trusted in what I was doing. I knew he'd come out hard in the third but I got back into it in the fourth and hit the right lines and length. "But I have to stay grounded. I can't just be happy with that win, there's plenty of squash left in this event and I want to go further." 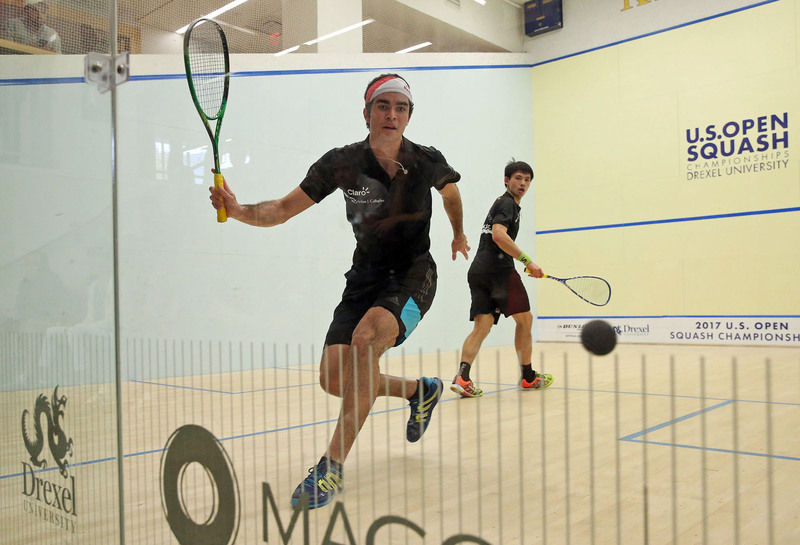 Coll will now go up against another Egyptian, former World No.3 Omar Mosaad, in the second round while Peruvian former World Junior champion Diego Elias, currently at a career high World No.15, sealed his place in the second round following an impressive 3-0 win over Hong Kong's Max Lee. “You’re always a bit nervous in the first round so I just tried to relax,” said Elias. “I was moving well and feeling really good on court. I’m feeling fresh right now, I’ve been training hard and I’ve been playing well." 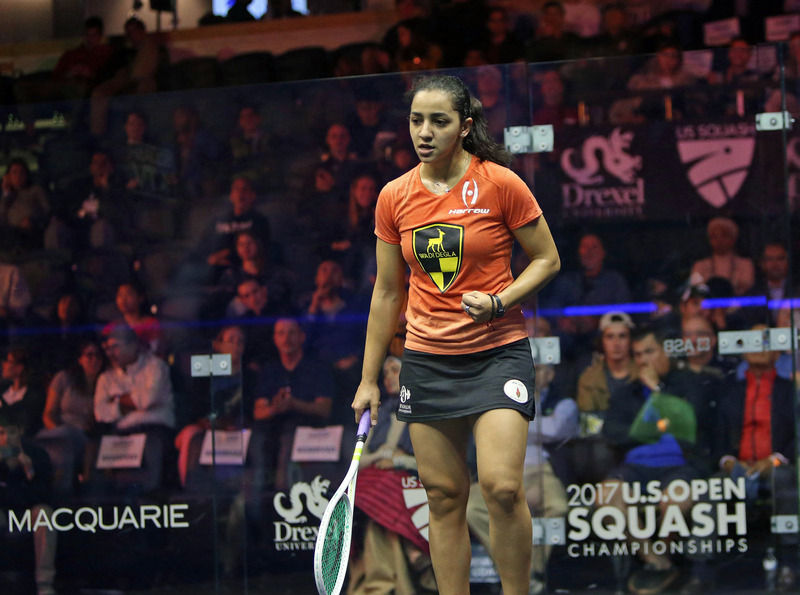 In the Women's draw former World No.1 Raneem El Welily used a get out of jail card to keep her tournament hopes alive after a Jekyll-and-Hyde performance against Canadian qualifier Hollie Naughton. 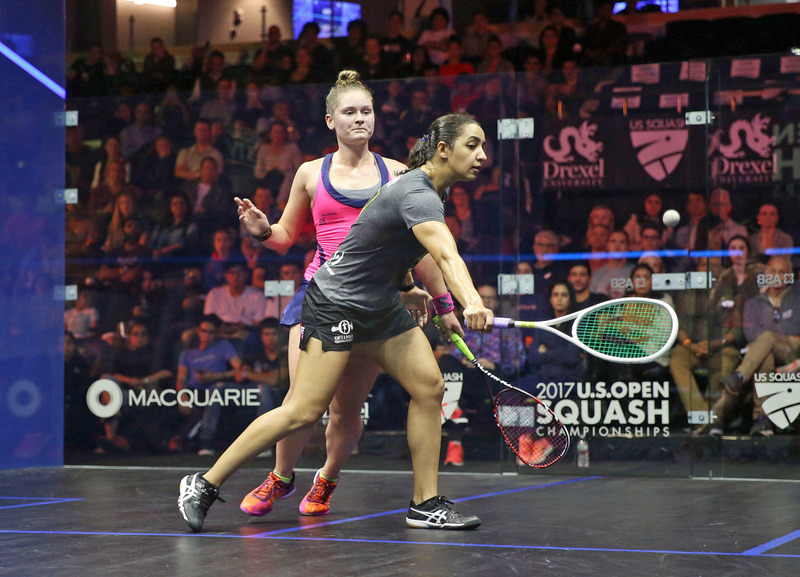 El Welily could do nothing to stop the 22-year-old in the early going as Naughton, playing inspired squash, stormed through the first two games 12-10, 11-9. El Welily then hit her own purple patch, restoring parity on the scoreboard to take the match into a fifth game, where Naughton squandered a golden opportunity late on to gift the match to the Egyptian. “She gave me a gift at the end and thankfully I'm still alive in this event,” said El Welily. The win means El Welily remains on course to meet defending champion Camille Serme in the semi-finals after the Frenchwoman put in a clinical display to defeat wildcard Haley Mendez. “I’m very happy to be back,” said the 28-year-old following her win. “I love playing here. It’s an amazing venue and an amazing crowd so I’m just trying to enjoy my squash. 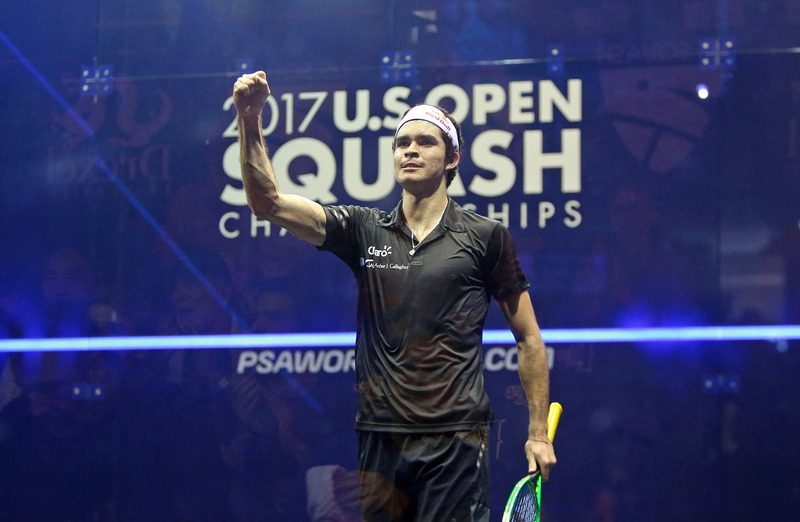 Mexican Cesar Salazar pulled off a huge upset during the first round of action at the 2017 U.S. Open Presented by Macquarie Investment Management as he downed former World No.1 James Willstrop to reach the second round of the PSA World Series tournament for this first time in his career. The 29-year-old World No.19, who lost an agonising fifth game tie-break against eventual champion Mohamed ElShorbagy in the first round twelve months ago, showed impressive composure as he recovered from dropping the opening game to prevail in a mammoth 82-minute five-game encounter that saw the pair produce squash of the highest calibre. Utilising his speed and agility to attack Willstrop and force a high tempo, Salazar was rewarded when he held off a late Willstrop surge to come through 5-11, 11-9, 10-12, 11-6, 11-9 and set up a second round match with German Simon Rösner. “I think the U.S. Open is one of my favourite tournaments – I love coming to play here,” said Salazar, who's twin brother Arturo lost out to England's Daryl Selby in his first round match. “I worked really hard in pre-season and this is a good start for me. To beat a really top player like James you have to play your very best and some more, so I'm really happy with my performance. 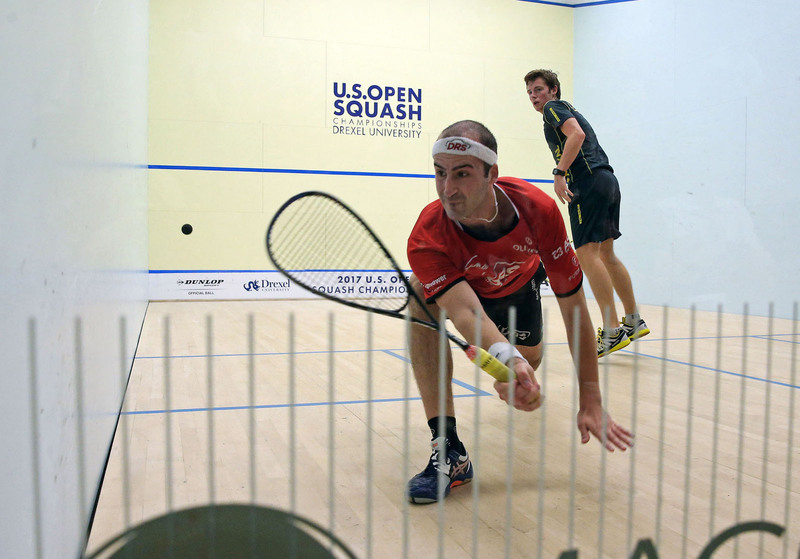 Rösner defeated Scotland's Greg Lobban 3-0 while last year's runner-up Nick Matthew, the 37-year-old Englishman competing at the U.S. Open for the last time in his career, made a successful start to his title bid with a 3-0 win over Zahed Mohamed. "My focus today was to try and close the door on him when I was ahead because these young guys are so good nowadays – they’re a little bit faster than me so I have to be clever," said Matthew (right). 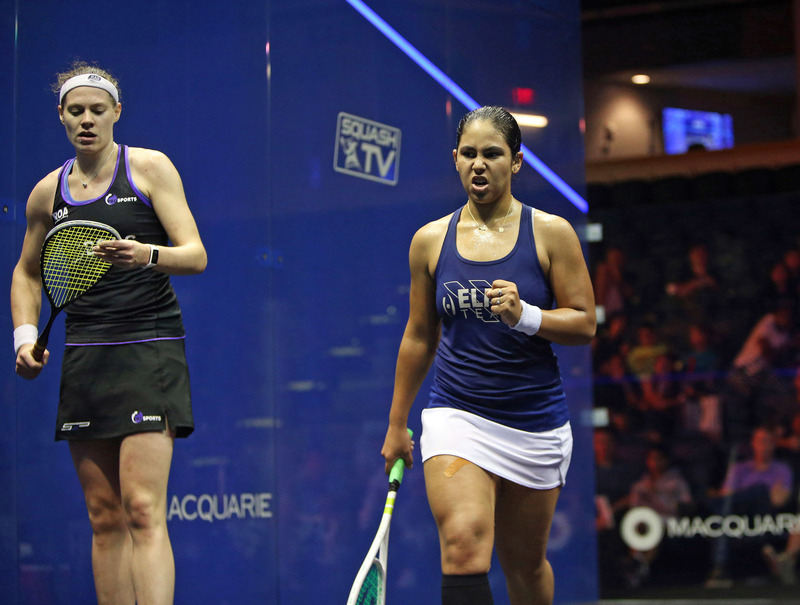 In the Women's draw there was contesting fortune for England's recent NetSuite Open winner Sarah-Jane Perry as she suffered a surprise defeat to Egyptian Salma Hana Ibrahim (below left) in the very first match of the day. Ibrahim, World No.19, played free flowing attacking squash to come through 11-7, 11-3, 12-14, 11-6 and knock the No.7 out at the first hurdle and set up a second round encounter with compatriot Nour El Tayeb. “I’m very happy with the performance today,” said the 21-year-old following the match. “SJ has been playing really well recently but I knew I had to keep the ball tight as much as I could and not give her many opportunities. Elsewhere there were straight forward wins for all seeded players including top seed Nour El Sherbini, who dismantled Mariam Metwally 3-0 in just over 20 minutes. Two-years after retiring from the PSA World Tour, Ireland’s Madeline Perry sprung one of the biggest surprises of the day to defeat World No.29 Coline Aumard in the final round of qualification at the 2017 U.S Open Presented by Macquarie Investment Management and secure a place in the main draw of the PSA World Series tournament. 40-year-old Perry, competing in her first event in almost 18 months, recovered from a 1-2 game deficit to come through and defeat Aumard 8-11, 11-5, 4-11, 11-5, 11-5 and set up a compelling first round match with American hopeful Olivia Blatchford – whom she defeated in two previous encounters in 2014 and 2015. Meanwhile there was also success for Canadian Hollie Naughton as she prevailed in a similarly tough five-game battle with second seeded Fiona Moverly to claim an unexpected debut appearance in the first round of the U.S Open to face Egyptian Raneem El Welily. Compatriot Samantha Cornett will also appear in the main draw for just the third time in her career after an impressive 3-0 win over Belgian Nele Gilis. Unseeded Amanda Landers-Murphy of New Zealand was the other surprise qualifier in the women’s draw while in the Men’s event Frenchman Lucas Serme put in a highly impressive display to down second seeded Nicolas Mueller 3-0 in just 23 minutes – earning a place to take on Ali Farag in the first round. Another unseeded player, Egyptian Mazen Hesham, followed up his first round win over number twelve seed Raphael Kandra with a 3-0 win over number six seed Declan James. Hesham will now face Colombian Miguel Angel Rodriguez in one of the stand out encounters of round one. Arturo Salazar, Adrian Waller and Abdulla Mohd Al Tamimi also overcame the seedings to secure their main draw berths. France’s World No.2 Camille Serme is feeling positive ahead of the 2017 U.S. Open Presented by Macquarie Investment Management where she aims to defend her title when the tournament takes place between October 7 - 14 at Philadelphia’s Drexel University. The Frenchwoman finished a semi-finalist in her first tournament of the 2017/18 season at the J.P. Morgan China Squash Open and Serme admitted she was keen to get her season off to a better start than last year, when she suffered early exits at both the Al Ahram International and the Hong Kong Open. “It was important for me to start in a better way than last year, and it’s already the case,” said the 28-year-old. Serme made history last year when she became the first Frenchwoman in history to lift the coveted U.S. Open trophy, beating World No.1 Nour El Sherbini in the final, and the World No.2 insisted she can’t wait to return. The U.S. Open marked a turning point in Serme’s season last year with the Frenchwoman then going on to win the J.P. Morgan Tournament of Champions and Cleveland Classic tiles over the course of the season and she is looking forward to challenging once again amidst strong competition on the Women's Tour. “It gave me a big boost, I felt more confident after the tournament last year. Especially because I beat really good players such as Laura [Massaro], Amanda [Sobhy] and Nour El Sherbini – it showed me that I could beat those girls. “The Women’s Tour hasn’t been as strong and exciting as it is now. I like the fact that every girl has a different type of game. You have to adjust your tactic for each girl and it’s more interesting. Serme will open up against tournament wildcard Haley Mendez on day two of the main draw on October 8 and insists she is just going to take it one game at a time when it comes to the defence of her title. 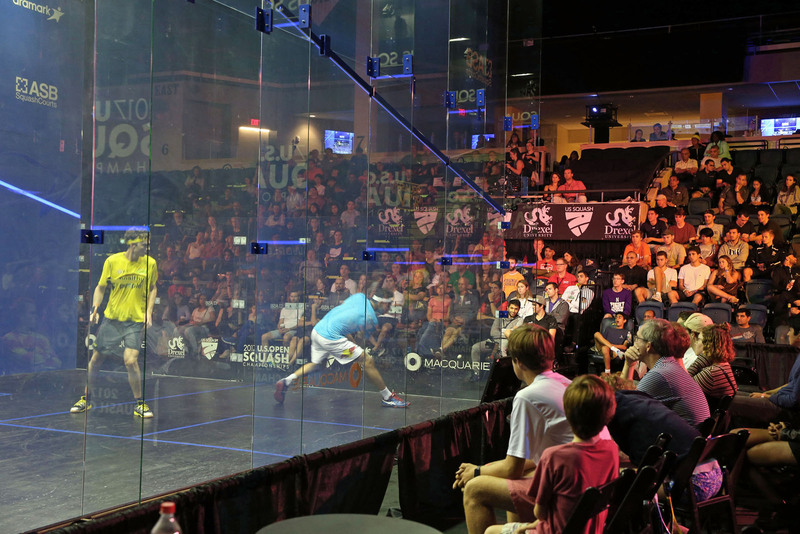 The U.S. Open offers players the first chance to gain points for the World Series Standings as they bid to qualify for the season-ending PSA World Series Finals – with only the top eight players on the men’s and women’s standings earning a coveted berth at the lucrative tournament. A men’s tournament also features in Philadelphia and sees defending champion Mohamed ElShorbagy appear in a world-class draw that also stars the likes of World Champion Karim Abdel Gawad, 2007 winner Nick Matthew and World No.5 Ali Farag. Qualification for the 2017 U.S. Open takes place between October 5-6, while the main draw will be held between October 7-14 inside the Daskalakis Athletic Centre at Drexel University. Egypt’s World No.3 Mohamed ElShorbagy returns to the 2017 U.S. Open Presented by Macquarie Investment Management next week as he looks to defend his crown when the tournament gets under way October 7 - 14 at Philadelphia’s Drexel University. 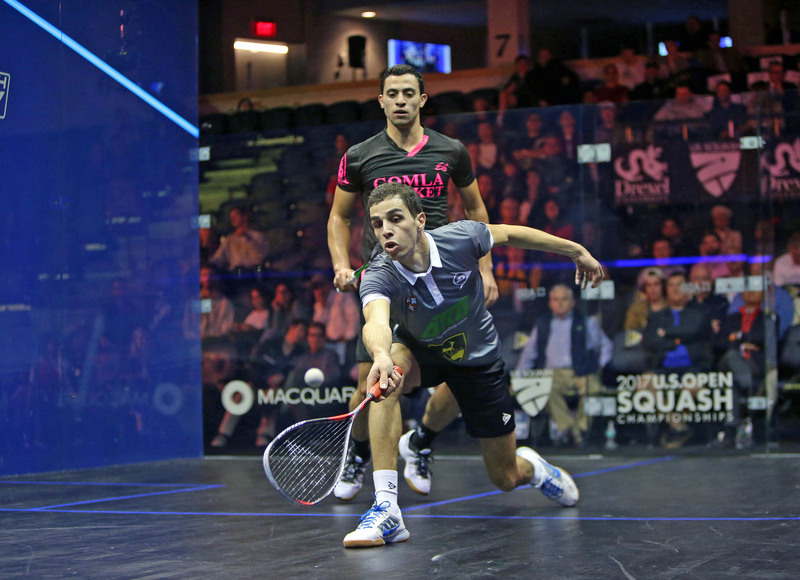 The 26-year-old Egyptian defeated England’s World No.4 Nick Matthew at last year’s instalment, with the Englishman forced to retire in the fifth game of their title decider, and ElShorbagy is looking forward to playing at the World Series event once again this year. 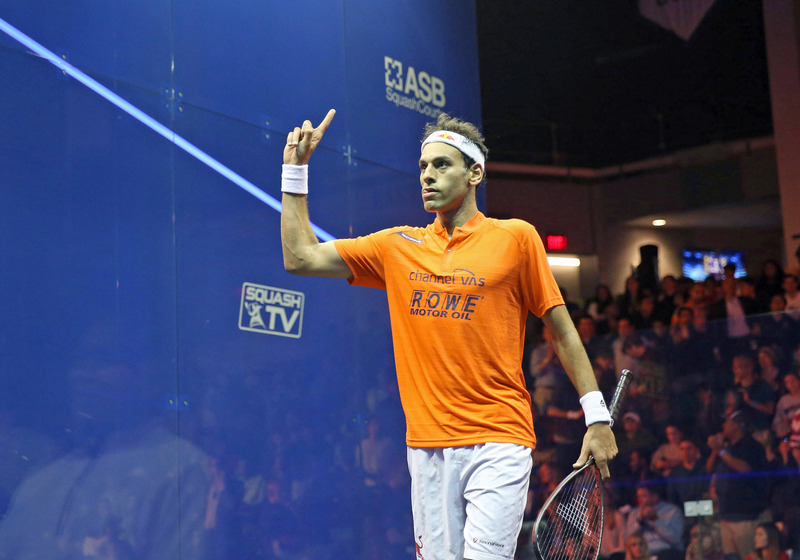 “I really enjoy playing there,” said ElShorbagy. The Egyptian – who is seeded second at the tournament following the withdrawal of World No.1 and top seed Gregory Gaultier – recently reigned victorious at the Oracle NetSuite Open, picking up his first title of the season, and will open against Australia’s World No.17 Cameron Pilley in round one at the U.S. Open. 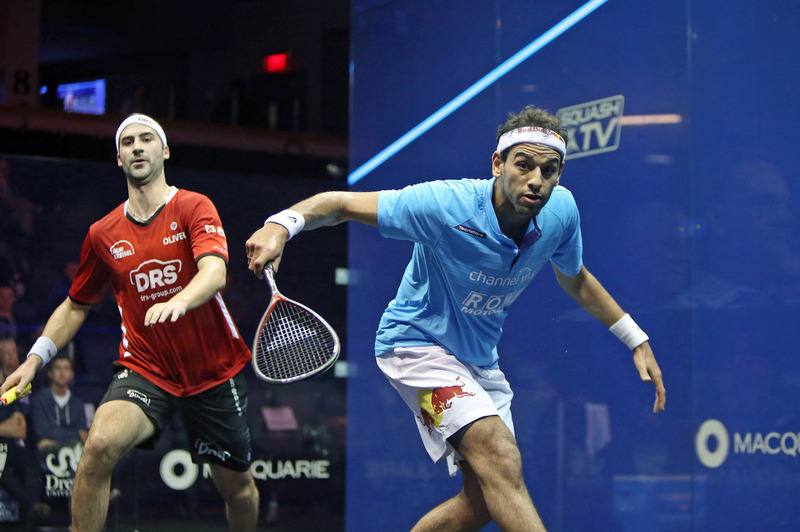 ElShorbagy has won the U.S. Open twice in the last three years as he also conquered compatriot Amr Shabana in the 2014 final – with that victory leading him to the coveted World No.1 spot – and the Egyptian is hoping his good run at the tournament continues. He said: “I have great memories because it is the tournament that got me to World No.1 three years ago. “I’ve won it twice in three years and when I didn’t play very well last season it was one of the tournaments I won, so I have good memories there. The U.S. Open also features a women&#39;s event and represents the first chance for players to earn points for the World Series Standings as they bid to qualify for the season-ending PSA World Series Finals – with only the top eight players on the men’s and women’s standings earning a coveted berth at the lucrative tournament. 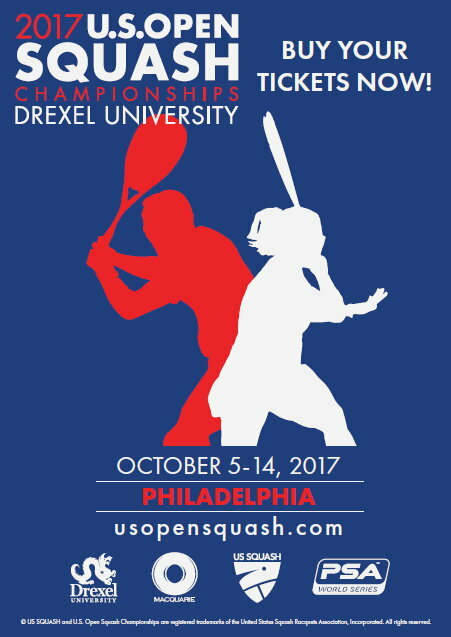 Qualification for the 2017 U.S. Open takes place between October 5-6, while the main draw will be held between October 7-14 inside the Daskalakis Athletic Center at Drexel University. 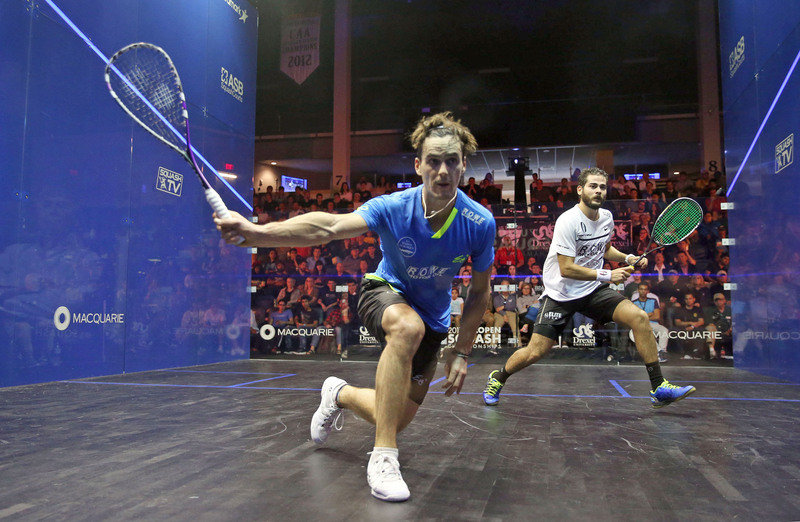 French World No.1 Gregory Gaultier and former World No.1 Ramy Ashour have both withdrawn from the first PSA World Series event of the 2017/18 season - the 2017 U.S. Open Presented by Macquarie Investment Management - due to injury. 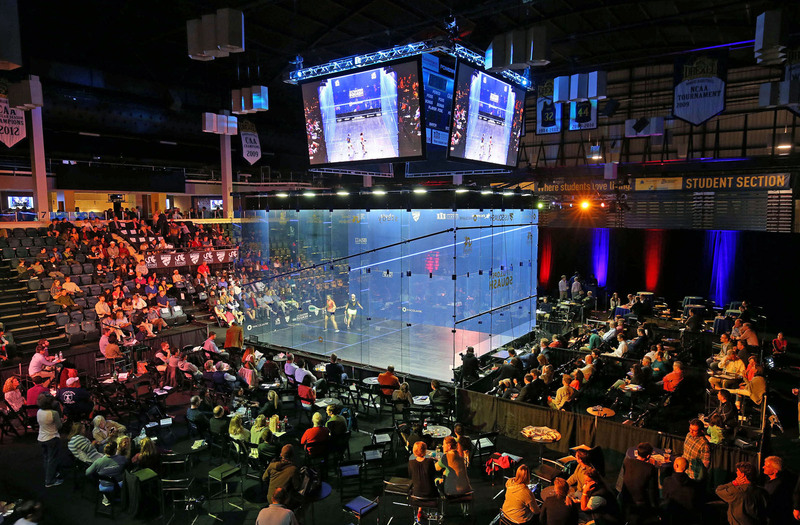 A number of the world’s top players will go head-to-head right from day one at the 2017 U.S. Open Presented by Macquarie Investment Management after the draws for the PSA World Series tournament were released today (August 21). 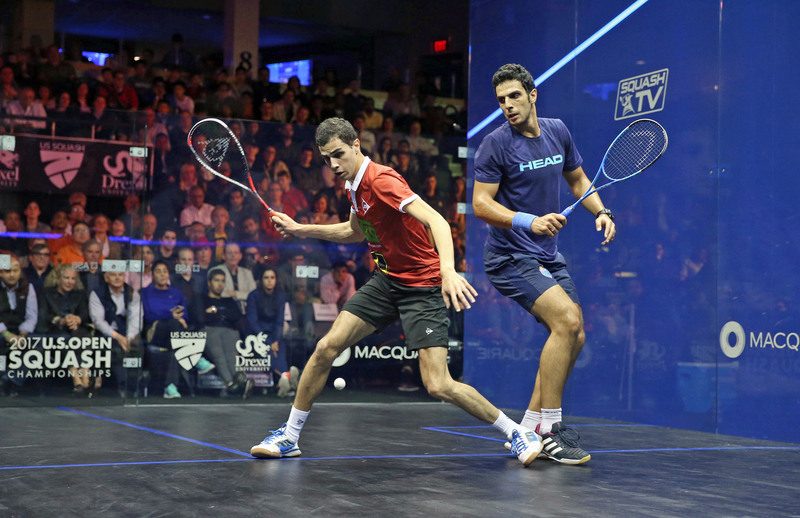 Taking place between October 7-14 in Philadelphia’s Drexel University, the U.S. Open is the first World Series tournament of the 2017/18 season and will see World Champion Karim Abdel Gawad take on World No.12 Paul Coll in the pick of the opening round matches in the men’s draw. Number two seed Gawad has been drawn on the same side of the draw as defending champion Mohamed ElShorbagy and is seeded to meet the former World No.1 - who begins his tournament against a qualifier - in a mouthwatering last four encounter. Elsewhere, World No.1 Gregory Gaultier gets his tournament under way against Australia’s Cameron Pilley, with the top seed set to face last year’s runner-up Nick Matthew for a place in the final if both players can play to their seedings. Maverick Egyptian Ramy Ashour will also be in action and he will take on tournament wildcard Christopher Gordon, who will have home hopes on his shoulders as he aims to claim a first ever win over the three-time World Champion after defeats in 2006 and 2008. Women’s defending champion Camille Serme will begin her tournament against World No.53 wildcard Haley Mendez and she is seeded to meet World Championship runner-up Raneem El Welily in the semi-finals. The top half of the draw will see World No.1 Nour El Sherbini - who lost to Serme in last year’s final - take on fellow Egyptian Mariam Metwally on day one, while World No.4 Laura Massaro, a winner in 2011 and 2015, is seeded on the same side of the draw as El Sherbini and will line up against compatriot Millie Tomlinson. The U.S. Open will also see players compete for points on the World Series Standings for the first time in the 2017/18 season, with only the top eight men and women on the standings qualifying for a coveted berth at the season-ending PSA World Series Finals. Qualification for the 2017 U.S. Open Presented by Macquarie Investment Management takes place between October 5-6, while the main draw will be held between October 7-14 inside the Daskalakis Athletic Centre at Drexel University. Action from the tournament will be shown live on SQUASHTV (Rest of World) and Eurosport Player (Europe Only), while the semi-finals and finals will be shown live on mainstream broadcast channels around the world, including BT Sport, beIN Sports, Fox Sports Australia and Astro.